We've been in business since 1994 and we know how to turn a plain display or exhibit space into an extraordinary branded marketing tool! 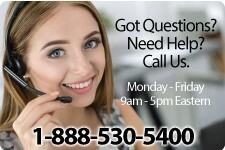 We know what we're doing and we won't waste your time ... or miss your deadline. 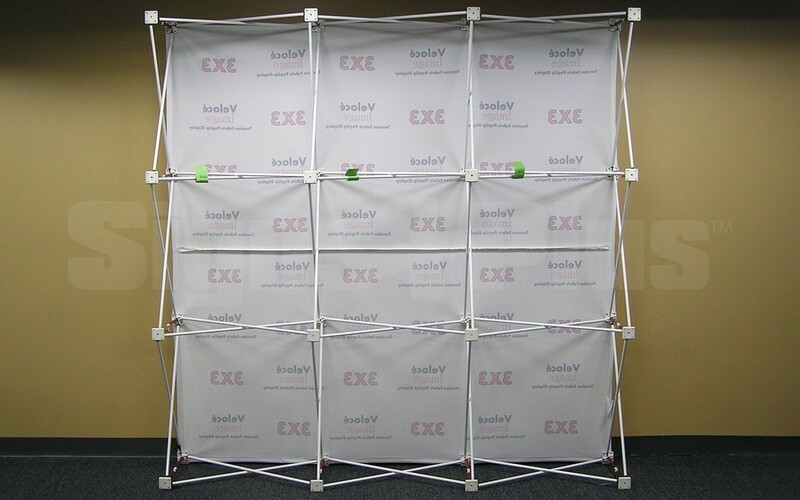 The Velocé Image is a basic economical pop-up backwall display which has a light weight yet strong tubular metal pop-up scissor frame that expands like an accordian to open, and suspends a dyed fabric graphic mural. It sets up in about 20 seconds and is absolutely the easiest and quickest portable backwall to set up! The Velocé Image 3x3 7.5 foot wide straight display has an 85.5" wide x 85.25" high x 14" deep display size which gives plenty of space for a backwall with impact and its straight shape provides good visibility from many angles. To set up the display, you just expand the frame like an accordian, then join the locking arms at the hub locations around the perimeter of the frame (and one in the middle) and you're done! The permanently dyed (washable, ironable) polyester knit fabric graphic stays Velcro'd to the frame even when it's stored away, so there's no time wasted attaching it to the frame. When the frame is collapsed, the fabric may look somewhat wrinkled, but as you expand it the wrinkles are "pulled" out so the fabric looks smooth and flat. Please note that this graphic is seamed (joined) together half way up so there is a visible seam line along the width of the display. This is not noticeable to most viewers, but it may be a concern to some. Most exhibit spaces now require flame-retardant materials and this inherently flame resistant (IFR) fabric passes NFPA 701 Small Scale certification, so it meets fire code regulations. 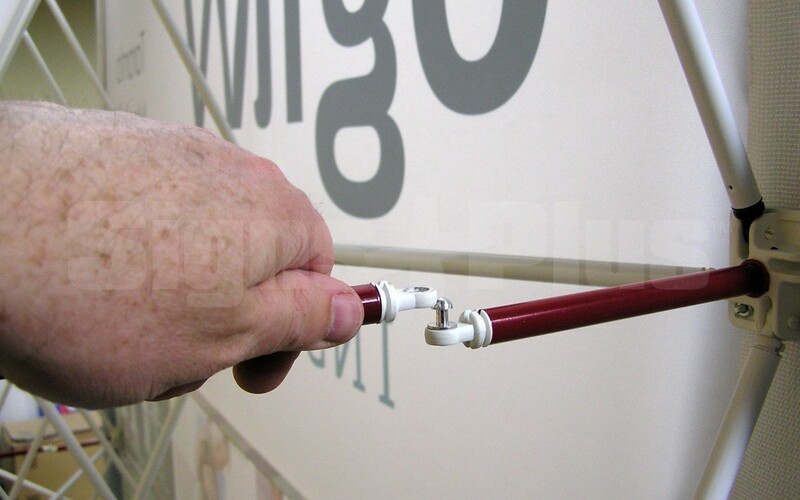 The printed fabric graphic connects to the hubs around the perimeter of the frame with Velcro tabs so it is possible to order a new fabric graphic and you can then put a new graphic on an existing frame in the future, quickly and easily. 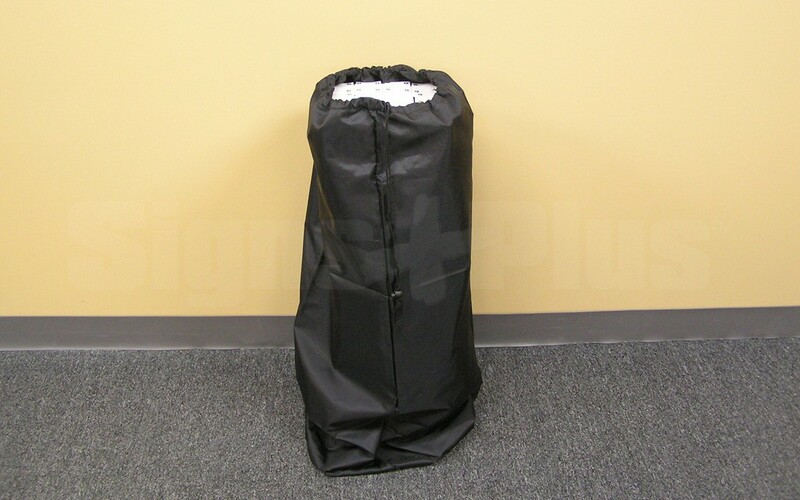 The display can be transported or stored in the included lightweight soft nylon carrying bag, or you can order an optional molded hard shell plastic shipping case with wheels. 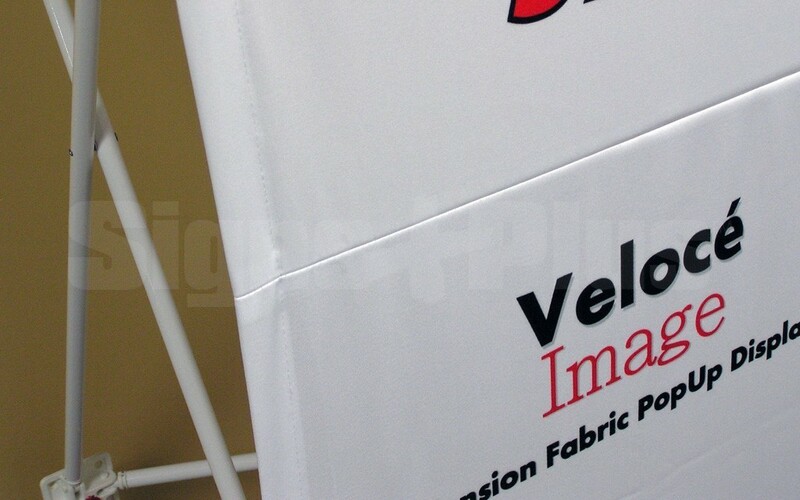 Each Velocé Image complete kit comes complete with lightweight formed metal scissor style pop up frame, soft nylon carrying bag and printed fabric graphic. The printed fabric graphic includes full digitally dyed content and velcro tabs sewn at hub locations around the perimeter to attach onto the frame. Velocé Image is available in several different sizes in straight models to suit everything from table-top to large space use. Ideal for use as a trade show exhibit backwall, media wall, press conference step and repeat logo background, or graphic image backdrop. 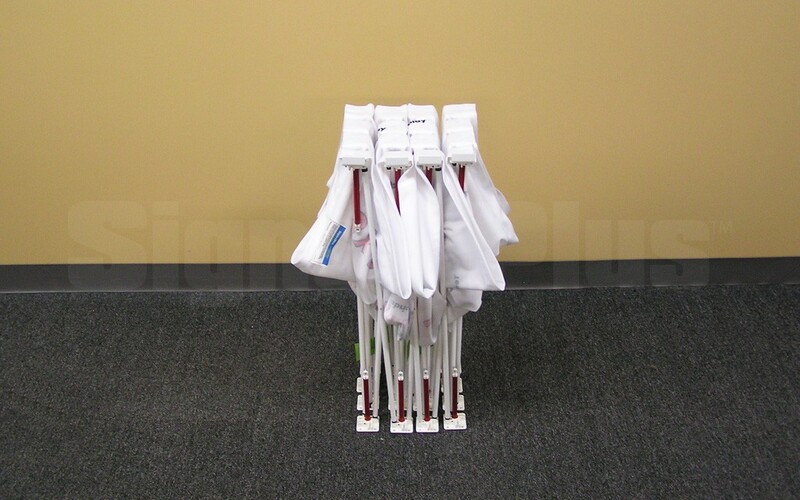 With a large, clean image area they're very effective, and their easy setup makes them a pleasure to use.